As with Batman, the story of the creation of his greatest nemesis is in dispute. 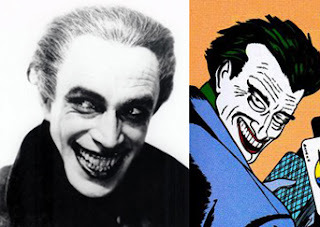 The Joker’s fathers were, in one capacity or another, Bob Kane, Bill Finger and Jerry Robinson, with actor Conrad Veidt in the 1928 film, THE MAN WHO LAUGHS the undeniable visual inspiration. But exactly who contributed what is lost to history. Which is fitting, considering that the character himself remains an enigma after almost 70 years. Introduced in BATMAN #1 in 1940, the Joker was as terrifying and deadly a villain as comics ever produced. Ironically, he was almost killed off in that first issue, but a wise editor realized the character was too good to not use again. The Joker would return to terrorize Batman and Robin many times over the next decade, always just eluding capture or death. In DETECTIVE COMICS #168 (1951), an explanation was finally given for the Joker’s peculiar visage. Turns out, he was a thief called the Red Hood (named for his, um, red hood) who robbed a playing card company and escaped capture by the Batman by swimming through a chemical disposal system, emerging with white skin, green hair and ruby red lips (the rictus is apparently natural). I had no idea that making playing cards required such nasty chemicals, but that’s why comics are such a great educational tool! But that story fell short of giving the villain a name and a further backstory. Wisely, all it did was explain why the Joker LOOKS like he does, leaving his insane motivation a mystery. Even Alan Moore and Brian Bolland’s THE KILLING JOKE, 1988’s ostensible origin of the Joker contains an internal disclaimer, as the villain admits to remembering his past differently from day to day. Combined with a completely psychopathic personality and a lack of true identity (despite what Tim Burton would have you believe, his name is not Jack Napier and he did NOT kill Bruce Wayne’s parents), the Joker is the perfect evil id to contrast the Caped Crusader’s Superego. When Batman comics got silly in the 1950s, so did the Joker, becoming a harmless prankster who simply tormented Batman with stupid gags and crimes. By 1964, when Julius Schwartz took over editing Batman’s comics, the Joker was practically gone. But in 1966, when Cesar Romero slapped white makeup over his mustache, the DC suits mandated the return of the Clown Prince of Crime. But it wasn’t until Denny O’Neil and Neal Adams’ 1970s Batman stories that the Joker was brought back to his full malevolent greatness (see Bat-Bronze Beauty #24). 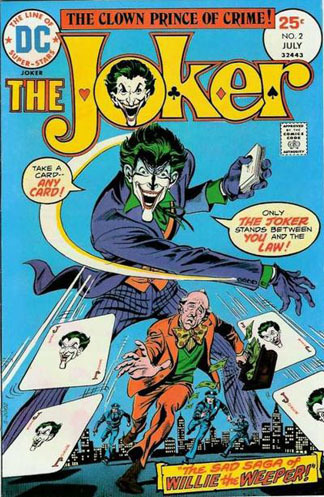 And then, in 1975, the Joker earned the distinction of being the first major DC super villain to receive his own comic book. This oddball series, lasting a mere nine issues, pitted the villain against a number of different DC bad guys and heroes (one notable exception being the Batman). THE JOKER #2 (July 1975) finds the Grinning Gargoyle help a criminal genius named Willie the Weeper overcome his compulsive crying and discover the joy of villainy. The cover (supposedly by Ernie Chua, but really looks like Irv Novick to me) utilizes a classic Batman motif, that of the oversized character or prop. 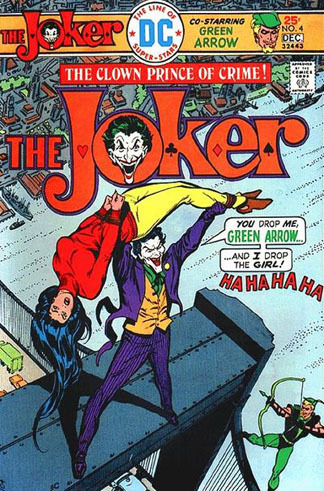 Issue #4 (Dec. 1975) finds the Joker falling in love with flower shop owner Dinah Lance, aka the Black Canary, the super-girlfriend of Green Arrow. The tale (by Elliott S! Maggin) is just okay, and the beautiful pencils of José Luis Garcia Lopez are tempered by the anemic inks of Vince Colletta, but I love the Chua (nee Chan) cover, awkward perspective and all. Following THE JOKER’s cancellation, the character remained one of the key players in the Batman universe, his place as Batman’s arch-enemy cemented even before he crippled Batgirl and killed the second Robin, Jason Todd (since resurrected). As much as Batman, the Joker inspires creators to put their own stamp on the character, both dramatically and visually. As for the Joker’s media adaptations, up to now, they’ve never come close to capturing the depth of his homicidal madness. Cesar Romero, obviously, was just a joke. The various animated versions of the Joker could only be so dark, although no doubt Bruce Timm would’ve loved to be able to have his animated Joker (voiced by Mark Hamill) live up to his comic book antecedent. As for Jack Nicholson… well, let’s just say the Joker’s not supposed to be likeable and leave it at that. For that reason, I am very excited to see Heath Ledger’s portrayal of the Joker in THE DARK KNIGHT. While the purist in me branches just a wee bit at the white face and green hair being makeup, the idea of the chemical bath just doesn’t work in Chris Nolan’s realistic Gotham City (I doubt we’ll ever see Clayface or Killer Croc in this series). I’m far more interested in the character feeling right, and this may well be the first time the non-fanboy audience sees the Joker the way he was meant to be. That is, terrifying. My breath is bat-bated. I can’t wait. I will post this cover on my blog and ask my readers to comment on your comment that Colletta's inks are anemic. I think your a fool but I'll leave it up to the majority. Dan, I didn't say Vinnie inked the cover, he inked the INSIDE, which suffers from his lazy pen. Also, it's "you're a fool" just for your information. And finally, WE'RE NOT FIGHTING. You're allowed to love Vince as much as I detest him and I bear you no ill will! Sheesh! My suggestion: publish a scan of what your talking about for your readers to see. You can buy a scanner for $99 at most office supply stores. Sheesh, indeed! Sigh. It's "you're talking" not "your talking." And for the last time (I swear), I'm not going to waste my time nor space putting up examples of bad inking. Anyone interested can easily find them for themselves (particularly at your site, amongst the petulant personal attacks). And I have a scanner. Goodbye. My, my, my, doesn't Vinnie Colletta inspire people to fight these days? I'm a big fan of Colletta's art but I totally understand why today's fans can't appreciate what he did. The reprints of his fine lines are completely lost.